"Life is not about waiting for the storm to pass. 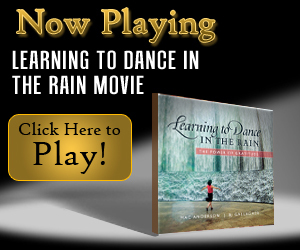 Its about learning to dance in the rain ." "All negativity is an illusion created by the limited mind to protect and defend itself." "People deal too much with the negative, with what is wrong. Why not try and see positive things, to just touch those things and make them bloom?" Oh boy, this was a timely inspirational negative quote for me to talk about. It kind of leapt from off the page when i was thinking what quote to talk about this week (only 2 more Weekly Wonder quotes to go now, by the way). Yes, Vivian Green's quote reminded me exactly what I need to do in my life now, as I face myself more and more: to laugh in the rain, and don't fret over the storm of my negativity as it tries to provoke me into more negativity. The truth is - and this is a VERY important truth, I'm understanding more and more right now - it isn't our negativity that is a problem, it's our negative reaction to our negativity. Yes, the problem is how we react to our negativity. This is what I'm trying to do each and every remaining day of my life. And if I even manage to do this 50% of the time, by golly my life will be sooo much more fun, it really will. I will be okay, with my down moods. I might even be able to joke at the daft, negative things I sometimes think. Might be able to mock myself. Okay, I know this so-called 'laughing at yourself' - this embracing the whole of yourself (dark and light) - is absolutely a journey of a life-time! I know it's not an easy path to take. I know I will fall down, lots of times. But this is my path I'm committing to - to embrace what comes, at all times - I declare it here and now, publicly, to all that read this. And it's not about dwelling in the negative. It's about 'being with' what feelings arise, with what emerges - whether the feelings are good ones or 'bad' (negative) ones. I will not run away, hide or try to 'make go away' my negativity any more. It's a part of me. And, I dare say, it's a part of you too. So what are you going to do with your negativity? What do you think about these other inspirational quotes about negativity also? What are your experiences of facing yourself, of being with your negativity? And, lastly, why do you think we all seem to be scared stiff of being with our negativity? What disasters will befall us if we dare spend quality time with it? I think the quote is great! it's a poetic rendering of what happens to our life, you simply cannot wait for something to pass but go through it with all your intention and self-confidence. It's not easy for many people to just do it and that's why this kind of sites and help are growing.